What sort of impact does war have on the human psyche and experience? That's the territory Donna Milner tackles in her lovely sophomore novel, The Promise of Rain (McArthur & Company). The author’s 2009 debut, After River, was quietly published and widely lauded, including a nomination for the IMPAC Award and publication in a dozen countries. The Promise of Rain, covers territory that is different yet similar, with echoes of secrets, loss and that hand of a stunning matriarch. Connected story-lines tell the tale of Howard, interred in a Hong Kong prison during World War II and his daughter Ethie, 11-years-old in 1962. My mother died on the same day as Marilyn Monroe, August 4th 1962, and just like the movie star her body would not be discovered until the following day. 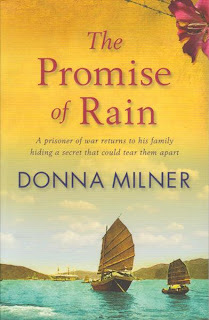 Milner’s voice is quiet, but she tells her tale compellingly, weaving a story of family secrets and the horrors of war that echoes chillingly through the years. It wasn’t right that the sun was shining that morning. I believed the whole world should be crying. Heavy raindrops should soak the earth, splash up from the pavement, run down the windowpanes like endless tears. Monica Stark is an American writer and editor and a contributing editor to January Magazine. She currently makes her home on a liveaboard boat somewhere in the North Pacific. Britain’s Best 20 Under 40?